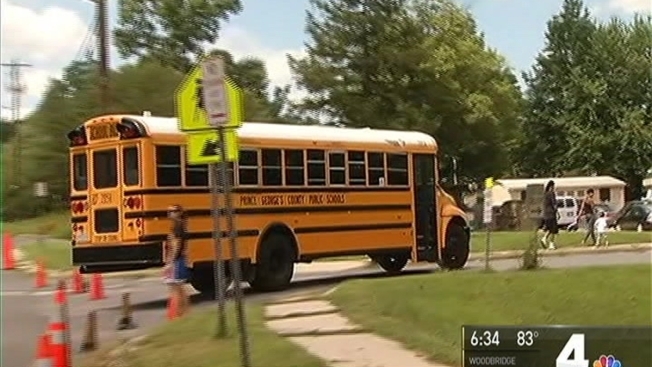 A Maryland school district said a little boy who just started kindergarten lives too close to his new elementary to ride a bus, but his father says he is too young to walk alone on busy streets. Five-year-old Anthony Flowers Jr. started kindergarten in Beltsville, Maryland, on Tuesday. His father said he has tried since July to get Prince George's County Public Schools to assign his son a school bus, but they refused. The family lives in the walking zone, within 1.5 miles for elementary schoolers, PGCPS said. Having Anthony Jr. walk a mile to school alone on streets with no sidewalks is not an option, his father said. "No kids play in the street here because they know it's dangerous. So what makes them think that a kid can walk to school on his own, especially at this age?" he said. Anthony Jr. also said he thinks the streets are not safe enough for him to walk. "It's dangerous. There's no sidewalk and it's downhill, so cars are, like, flying down the road," he said. "If cars are parking [on] two sides of the road and one's coming, then you could get hit." Flowers drove his son to school Tuesday morning and then left work in the middle of the day to pick him up. News4 contacted PGCPS. A superintendent with the transportation department went to the Flowers' neighborhood to look at Anthony Jr.'s route. "He told me to give him until Friday. He'll see what he can do," Flowers said he was told. In nearby Montgomery County, parents who let their 6-year-old and 10-year-old children walk a mile home alone from local parks was investigated by Child Protective Services for neglect. Danielle and Alexander Meitiv's parenting style was labeled "free-range."